I was 16 when I ate Japanese food for the first time. I remember I bit into a piece of sushi and promptly spat it out. I wondered why anyone would want to eat a cold and slimy piece of raw fish. Well, I have since come a long way - I LOVE sashimi now. When I next visited a Japanese restaurant, I decided to stay safe and ordered something cooked. So I picked a bowl of katsu don. I promptly fell in love with it. 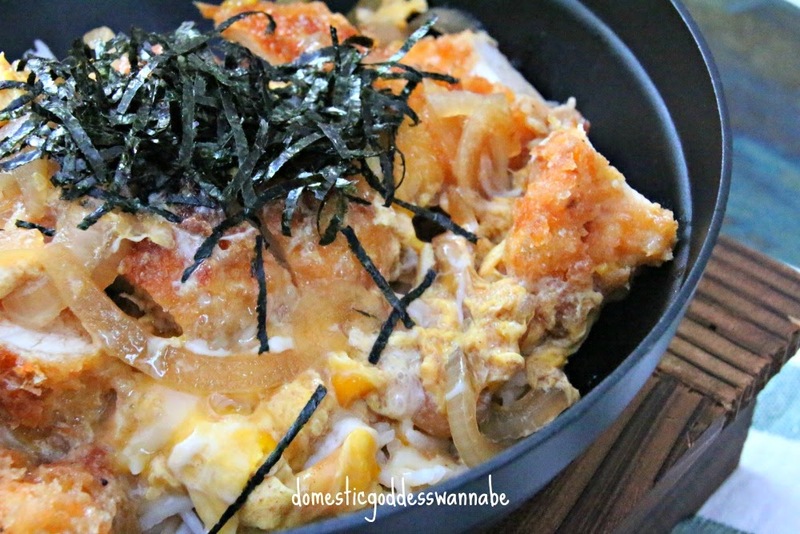 Years passed and I would order katsu don in restaurants but I never thought to try to cook it at home. To me, Japanese food was mysterious and I had no idea what ingredients to use anyway. 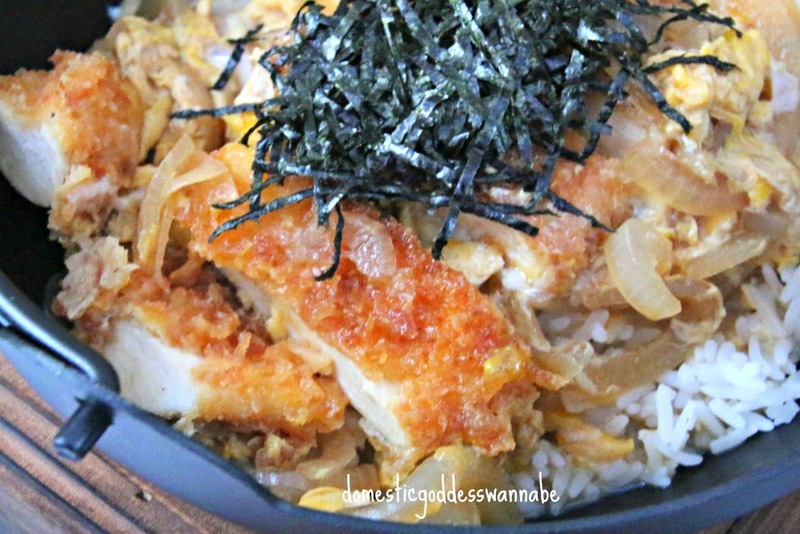 When I finally decided to cook Oyakadon, I was blown away at how similar the one I made tasted like what is served at restaurants (but made at a fraction of what it would have cost at a restaurant) and feeling encouraged, I decided to take on katsu don. 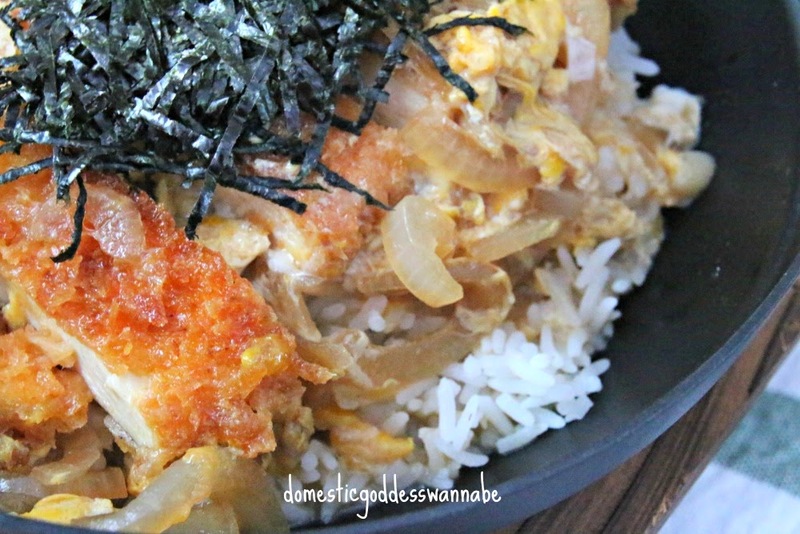 Today I am going to share with you my recipe for chicken katsu don. Since a katsu don cannot do without the the chicken katsu, I started by frying the chicken cutlet. To do this, trim a piece of chicken breast. You can cut the chicken into 2 pieces lengthwise if you prefer a thinner piece of cutlet. Season the chicken with salt and pepper. Dredge the chicken in corn flour, shaking off the excess flour. Then dredge in the beaten egg, again, shaking off the excess egg. Coat the chicken with panko bread crumbs. Carefully, place the chicken pieces into hot oil and fry them in batches until they turn golden brown. Once cooked, transfer the chicken onto cooling racks to cool a little. In the meantime, get on with the sauce. Into a saucepan, add dashi (dissolve one sachet of dashi granules in a litre of hot water), soy sauce, mirin, cooking sake and sugar. Also add the thinly sliced onions. Simmer until the onions became soft. If you prefer your onions to have a bit of a bite, cook for a slightly shorter time. Slice the chicken cutlet into smaller bite-sized pieces. Place the chicken into the saucepan. Followed by a beaten egg. Dish some cooked Japanese rice into a bowl. Place the chicken and sauce over the rice. This was really, really oishi! 2. Dredge in corn flour, then egg, and finally panko. Make sure chicken is well-coated. 3. Fry in oil until both sides have turned golden brown and chicken is cooked through. 4. Transfer into a cooling rack to drain and cool a little. 5. Place dashi (I added 1 packet dashi into 1 litre of hot water and stirred until the granules have dissolved), mirin, sake, light soy sauce and sugar in a saucepan. Add onions. Cook on medium heat until onions have become soft. If the liquid has reduced too much, add a little hot water. 6. Slice chicken cutlets into bite-sized pieces. Place in saucepan. 7. Add eggs and seaweed. 8. Transfer chicken and sauce on hot rice. Please join us tomorrow as Winnie from toddlymummy will be sharing her recipe for Tamagoyaki. A Japanese version of the favourite omelette, fried and rolled, with an added twist. Do check it out!